W hether it is a large corporate event for 2000 people, company Christmas party, Stampede party, an intimate party for 50 people, or any event you are organizing…we’ve done it, and we’ve got you covered. With a large list of songs including top 40 hits, rock, pop, dance, hard rock, and even some country, we can tailor a show that will be sure to keep everyone tapping their feet, singing along and dancing. All of this combined with the best front-man/entertainer in the city…we can guarantee your party/event will be a night to remember! Curious George played at our corporate Christmas party and were fantastic! Super high energy, if you weren’t out on the dance floor, you were just engaged watching them perform and have fun. Loved every song they played, they could read the crowd and kept everyone dancing all night long. They were all so professional, responsive and accommodating, from the minute we enquired to well after the party. Thanks guys for a fun night, great music and entertaining time. We booked Curious George for our corporate Christmas party and our employees loved them so much, they asked us to book them again the following year. The set list they played was high energy but tasteful for a Corporate Christmas party. They didn’t play their music extremely loud and were very flexible. Everyone in the band was well dressed for the event and the band delivered high energy fun while being extremely punctual and professional the entire evening. Curious George is a very talented, engaging band that is entertaining to both watch and listen to; they have a unique flair and are fantastic to have at a corporate party! If you want to have your guests on the dance floor having fun, I would suggest booking them. 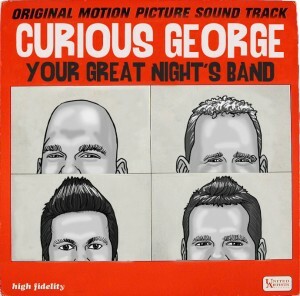 We booked Curious George for our holiday party, and they were the best band we’ve had to date. Their sets were great, and they had all of the guests out on the dance floor, which isn’t easy to do! They were also easy to work with and able to handle anything that came up. Thanks for an awesome performance! Our guests haven’t stopped saying how much they enjoyed the band and how amazing you guys were! You guys were definitely the icing on the cake of such a great day. You absolutely killed it and had people we never expected up dancing the night away. We will definitely come see you guys and say hello and I’m glad you guys enjoyed it. It was such a pleasure working with you guys. You completely exceeded expectations!! Thanks so much Curious George for playing at our outdoor Waterton party! The music was awesome and our guests had so much fun! You were great sports despite the 80km/hr winds and we loved having you there. Can’t wait to see you again in Calgary! Curious George Calgary’s Favourite Band is now Ponoka’s Favourite Band!!! Amazing time from the minute they rolled into town till the time they left. They played to all age groups from the very first song of the evening till the last encore!!! They had people on the dance floor screaming for more. We could not have asked for a better entertainment evening!!! Great music, good fun, and a really great bunch of guys to work with. We will be asking them back in the near future for an encore performance in an expanded venue with more people. A complete fun filled evening!!! We could not have asked for a better band for our first kick off party to raise funds for our recreational programs. The town is a buzz still talking about you. 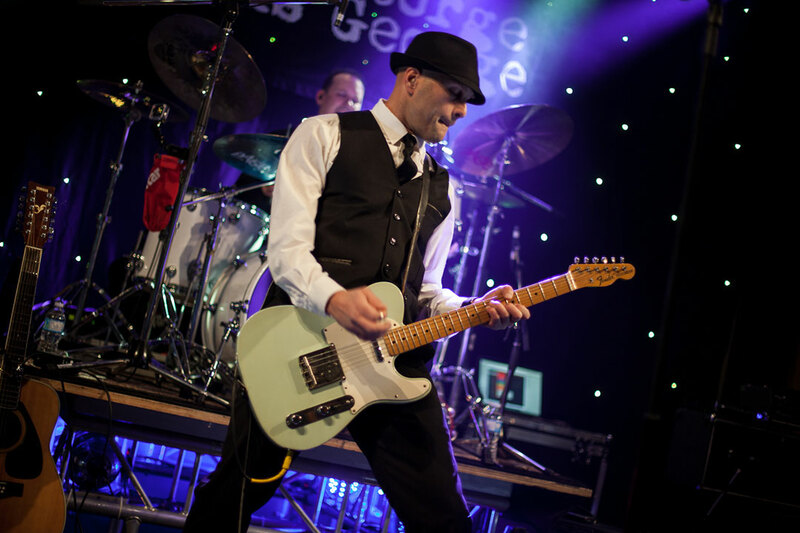 If you are interested in booking Curious George for YOUR next event please fill out the form and we will get back to you as soon as possible. The approximate number of people attending. Don’t forget to ask us about cool staging options like this! 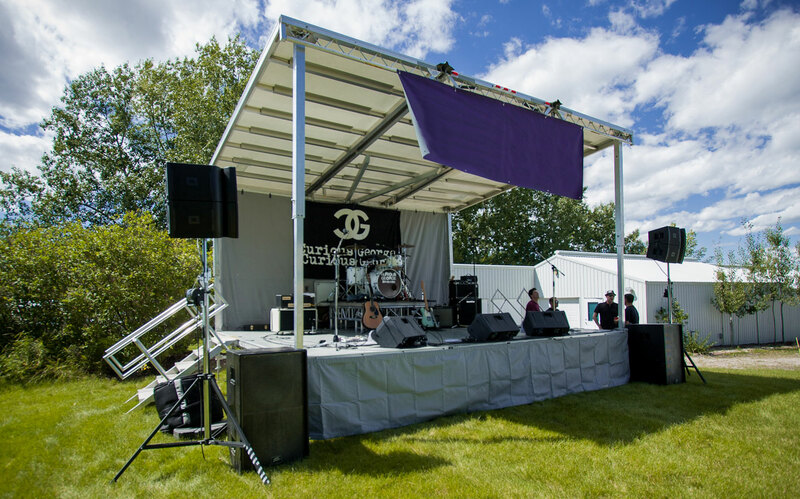 We have teamed up with Alberta’s premier production company Sound Advice Pro Audio & Visual, and as a result, can offer all sorts of production options like outdoor stages, star drapes, hazers, smoke geysers, video walls…you name it!